Let me start out by saying that I don’t really like baklava. Growing up in a Middle Eastern family, there was no shortage of baklava, kunefah, basboosah, etc, but as more of a savory than sweet kind of girl, none really held much appeal for me. My tooth has gotten slightly sweeter with age, however, even with access to what I would consider some pretty fresh and well made baklava, it’s never really hit the spot for me. That was until I went to Moda, a Turkish pastry shop off Istiklal Caddesi in Istanbul. It’s a chain, but whatever. I. Could. Not. Get. Enough. Seriously, it was like a drug. My mouth is watering just thinking about it. Mado may be a chain, but there were lots of locals there, and as someone who knows her way around a Middle Eastern dessert shop, let me tell you, their sweets were out of this world. There are a handful of these shops across Istanbul, but I went to the larger of the two on Istiklal Caddesi. The bright cafe was clamoring with activity even though we went at 11pm in the evening. And by clamoring, I mean, literally clamoring. At the front of the cafe an attendant serve Turkish ice cream, an elasticy dense version of the classic treat, which they dig into and clang inside its metal pot, sort of like a Turkish version of the ice cream truck’s bell. Inside, pastry cases are lined with colorful glistening dessert pieces and a pyramid of baklava rolls is displayed in the front window, beckoning dessert lovers inside. Check out this heaven on a plate. Here’s a run down of what’s happening. The top two green curly whirls are called fistikli and were my favorites of all time. Oh man. This type of baklava is made only with ground up pistachios, unlike some of the others which usually include phyllo dough or sometimes other types of nuts. Incredibly soft, sweet, and surprisingly smooth in texture considering it was made of pulverized pistachios. I could have eaten a truck load of these. The middle ones are called sobiyet, and has a slightly creamier filling of pistachios, semolina, and milk, wrapped in phyllo dough, and then covered in a light sweet syrup. The lower ones were a similar variation of nuts wrapped in phyllo, with a slightly more granular nut mixture inside. These are the more traditionally known type of baklava. The outer phyllo dough slightly crunches as you sink your teeth into the sweet moist filling. This interplay of textures is the key to fresh baklava. Baklava that’s been sitting in a box even for a few days, or is not made with such an expert hand to begin with, is dry, even when drenched in the sweet sticky syrup. The phyllo is too crispy and the insides top dense and dry. The baklava at Mado simply melted on your tongue and the textures played beautifully against one another. We ended up packaging a big box of baklava from Mado to take with us to our family in Cairo on the last day of the trip. We picked them up in the morning before we left, and broke out the box late evening that same day in Cairo. While they were still delectable, they lost a tiny bit of that magic that they had fresh in the cafe, delicately savored with a steaming tulip glass of Turkish tea. I still had to restrain myself to save the green ones for my family and not gobble them down myself, mind you, but it goes to show that some things are best experienced in the moment. 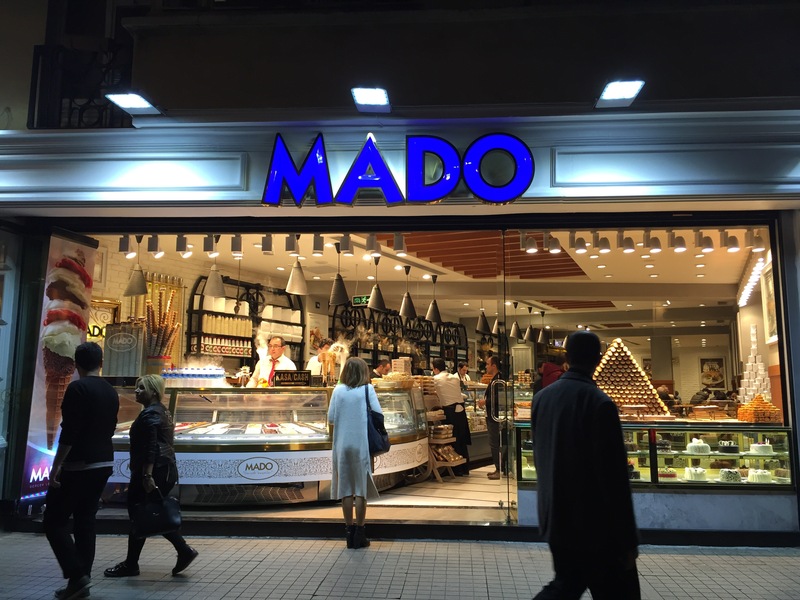 If you are in Istanbul, Mado is a must. Go once, go twice, go three times, like I did. You will not be disappointed, although you may leave Istanbul with your clothes feeling a little tighter.